SummaryThe motif is a fisherman under the Moon. He is expressed very elaborately. There is an inscription "Yasuchika". Very famous craftsman in Edo area. 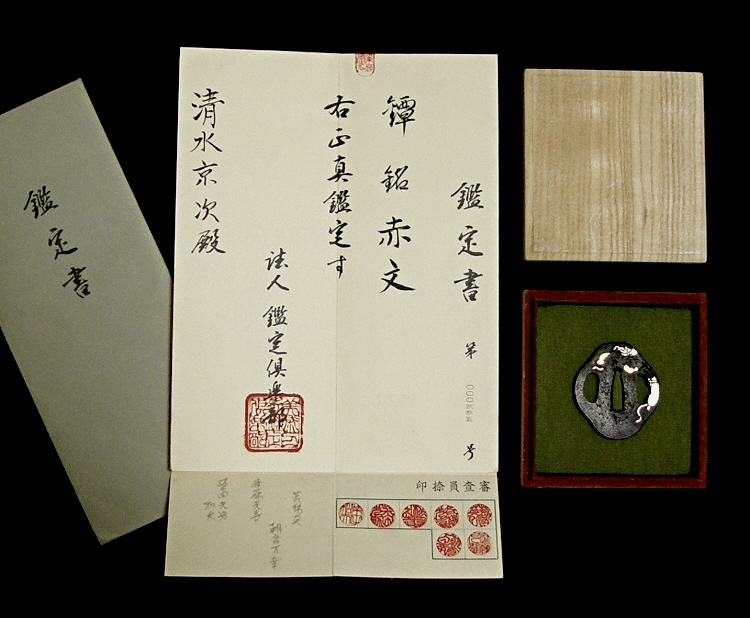 SummaryThe certificate issued by NBTHK proves that this tsuba was made by Koike Yoshiro, the founder of the Yoshiro-Shiki Shinchu-Zogan Style Tsuba. 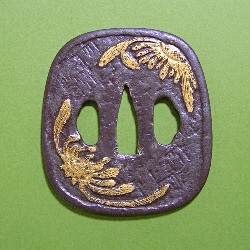 SummaryThis tsuba is authenticated as Genuine Sekibun by the organization of authority, Kantei Club. 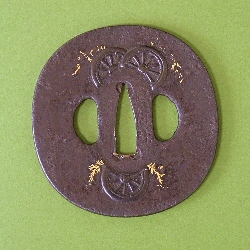 This tsuba is categorized as "Kyo-Kanagushi-Tsuba". Made of Yamagane, Iroe inlaid with gold. Looks gorgeous. This sword guard is categorized as "Aizu Shoami Tsuba". Ax and Hatchet are expressed in the Takabori and In-Sukashi. Inscription"Inhabitant of Edo area, Sakuma Yoshihide"
SummaryThe maker is famous tsuba craftsman Sakuma Yoshihide who was independent and never belonged to any tsuba school. SummaryGorgeous sword guard with gold inlay. Very beautiful tsuba for highest-ranking Samurai. 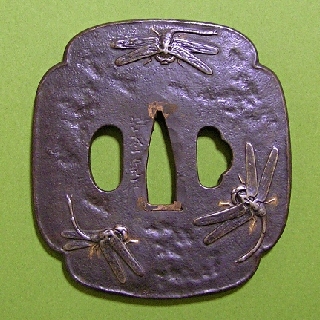 Inscription"Made by Inhabitant of Hagi in Choshu Province, Kawaji"
SummaryMade by Kawaji, one of the most famous tsuba craftsmen school in Choshu Province. SummaryMino-Tsuba for Wakizashi type sword in good condition. With very fine Nanako and the Iroe inlay with gold and Suaka. SummaryThis tsuba was made by master craftsman at the end part of the Edo period "Tanaka Kiyotoshi". Very unique sword guard made with Ukashi technique. SummaryThis Kozuka was made by the famous craftsman in Edo area "Horie Okinari". 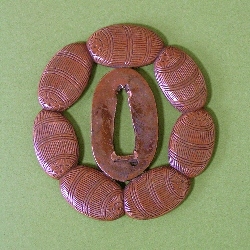 SummaryTypical Shoami tsuba. Inlaid with gold. Inscription" Iwamoto Ikkan (Monogram) "
SummaryThe maker is a collateral of the Iwamoto family. Very sophisticated finish. 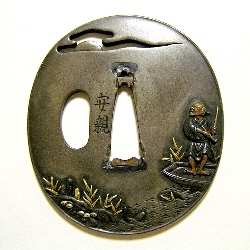 SummaryThe maker of this tsuba is Shimizu Jingo. Famous tsuba craftsman in Hogo Province. SummaryThe pattern is rice bale. Finished very well.